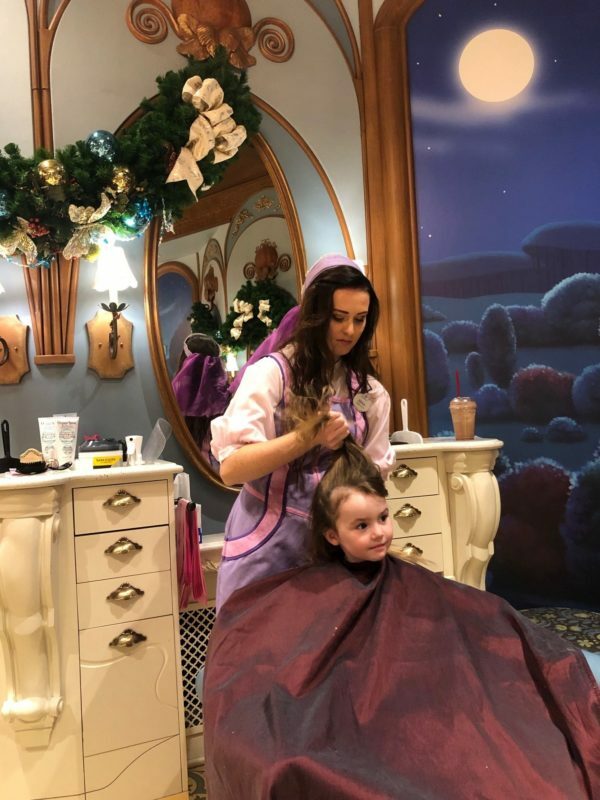 If you follow me on Instagram you will almost certainly have seen Edith’s experience at Bibbidi Bobbidi Boutique at Disneyworld and if you haven’t then, don’t fear, you can catch it on my story highlights and it’s well worth a watch just for her little face. I only decided to book a few weeks before the holiday – it had always been in my plans but then honestly, it’s a lot of money and I didn’t know if she would be game because she said she didn’t want to go one day and then changed her mind. Anyway, about 4 weeks before the holiday she started talking about it alllll the time and decided that she absolutely 100% HAD to have a princess makeover. Game on. 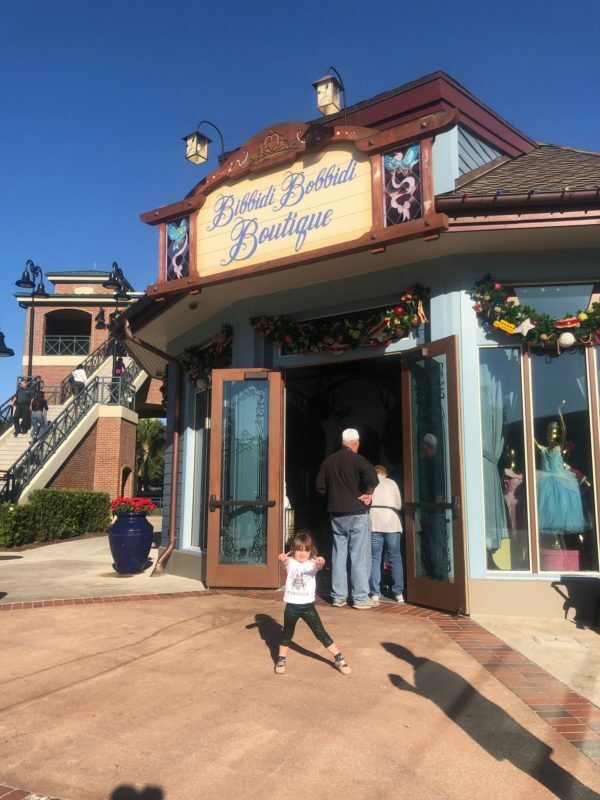 Booking at the Bibbidi Boddibi Boutique was surprisingly easy, I rang Disney World and they told me that only the Disney Springs shop had availability on the day I wanted to book her in – which I wasn’t surprised at to be honest, the Magic Kingdom one is notoriously difficult to get into. There were only a few slot left so we went with later afternoon because Edith is only 3 and I felt it would give her time to chill out in the hotel during the early afternoon after a walk around the park during the day. Notice how all of the Bibbidi Bobbidi Boutque prices say starting from? Yeah, that’s because your kid can add shizzle. Like shoes. Also, never be fooled by US prices – it’s so bizarre that everything is marked “plus tax” so basically, short of pulling out my calculator I haven’t a clue what the actual cost will end up being. Is everyone a maths boffin over there? Edith had the Castle Package and some shoes – I’m not going to lie, it was incredibly expensive for what it was, but the look on her face made it worth it to me. Less so for Adam who spent the majority of the time after her makeover when I finally came clean about how much it all cost twitching his eyes… If you don’t feel it is worth it or simply can’t justify that amount of money, we saw a lot of little girls coming in in their pre-bought dresses from Target etc and just having the Crown Package – still expensive but a LOT less. There is absolutely no rule that says you can’t do that and the staff really didn’t mind at all. I think we can all say that it is a mighty big expense and short of the one guy who said to his daughter “honey, you can have anything you want” whilst mum looked on in horror, everyone is looking to save a penny or two if they can. Once you’ve had a chat about what package you want to look at, it’s time to have a look at the dresses and accessories which are, of course, out on display and available to have a look at in a wardrobe style part of the shop front. You can try on the shoes, see what outfit you think looks the prettiest or you can have a look at the leaflet. The choice is pretty overwhelming – think of a Princess you love and they have a dress for her AND a fancy dress for her. Fortuitously for us, Edith is all about the pink so decided fairly quickly to go with the Aurora dress, but it might be an idea to have a chat with your child beforehand about what they want or you could be in for a long haul. As I mentioned, there are dresses that are fancier than others so it’s 100% worth agreeing something before if you are on a budget. Once that is decided… you wait. You might be waiting minutes or you might wait a bit longer, but at some point a helpful Fairy godmother (staff member) will come along and help you into the next waiting room, where you will be asked your sizes and then taken to a small changing room with a magical mirror. 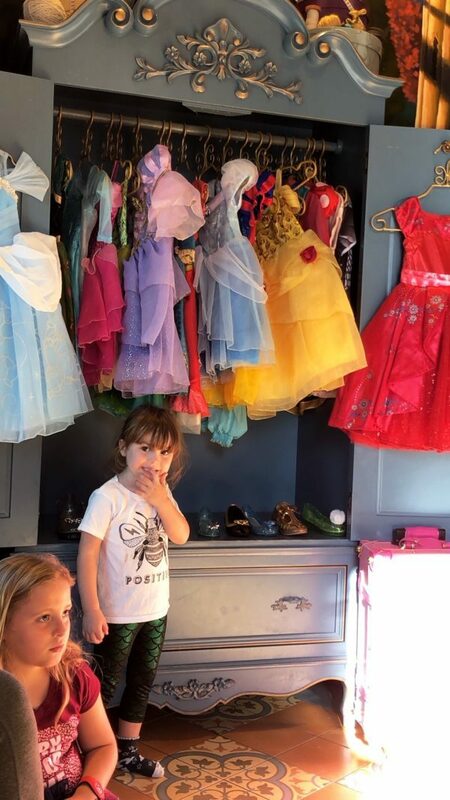 The dress will be hung up waiting for you, the fairy godmother will ask you to change your child and then will tell you to watch the screen – this part is MAGIC. The screen will light up with a message from the *actual* fairy godmother who will tell your child all about the wonderful things that will happen and how they are Princesses etc. Edith was spellbound and I was tearful, it was just so lovely and so well executed. 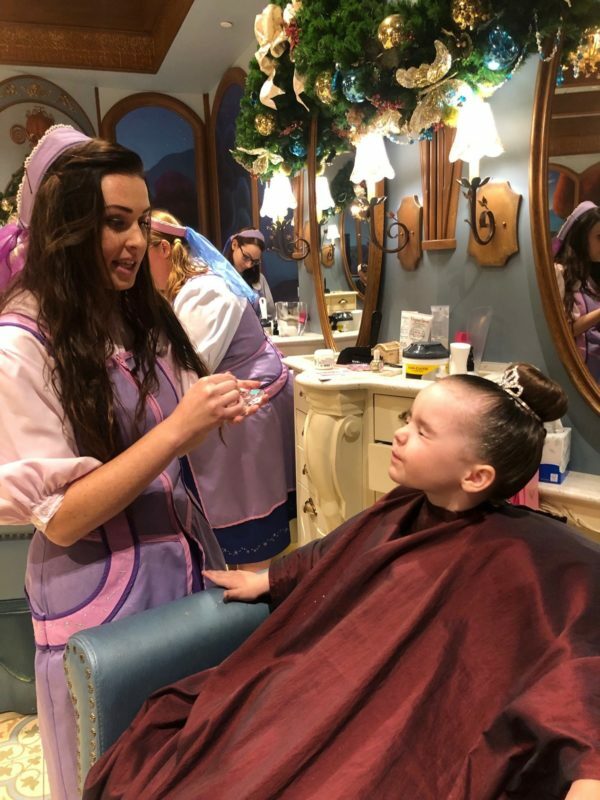 After this your Fairy Godmother will come back and you will move to the salon to meet a Fairy godmother in training who is going to do your hair and make up. Edith despises her hair being brushed, but she sat and enjoyed it (I had to pick my jaw off the ground on more than one occasion – each bay has a place for you to sit if you want to, you do have to stay with your children so no dropping and running, it ain’t daycare). I think it’s worth knowing that they are going to brush through your child’s hair beforehand so that you can give it a once over – especially if you have kids that simply hate it. From hair to make up, they are given the option to choose at every point and everything that they use you are allowed to keep! One of the things I really loved was the way that everything done was given an added touch. Tinkerbell had leant the salon her fairy dust for keeping hair in place and her magical fairy dust was in the nail polish too – everything that they did had a purpose and was just a little bit special. Yes, it’s overpriced, but ultimately you are paying for an experience and I don’t think you can always put a price tag on that. One thing that I will say, whilst we were in there I saw one little boy leaving and dressed as a Knight. Toby was adamant that he didn’t want to have the experience but seeing Edith and the attention that she was given seemed to change his mind and he is STILL asking me if he can go in. I can’t speak from the experience of a boy mama in there but there was absolutely no illusion that Edith would be a PRINCESS and not a knight, she wasn’t offered and I didn’t hear any other girls being offered Knight packages. If Toby wanted to do it, I kind of feel like less of a fuss would be made of him because he is male and because he wants a knight package, and again, I feel that if he asked to be a Princess that would be an issue. I’m basing it solely off a feeling but I see it going down that way. So all in all, we adored Bibbidi Bobbidi Boutique, it is the most amazing place and there are already plans from Edith and Toby to go back so I’m under no illusion that this was a huge hit! 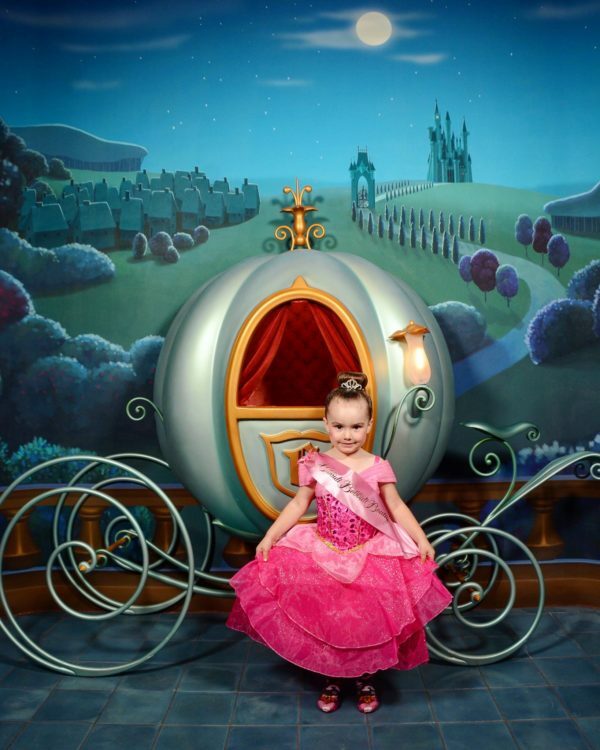 It’s always fun seeing these little girls prance around Disney all dressed up like their favorite princess. I never knew anyone who participated so thanks for giving us an inside view! 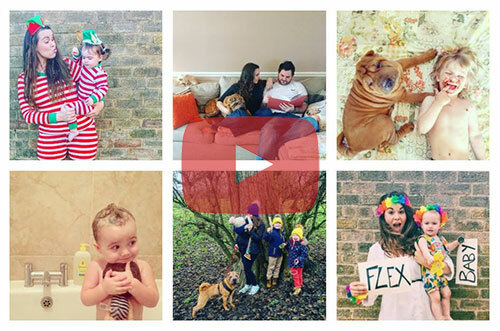 I’m for anything that encourages playful, positive parenting! OMG, this looks like a dream for my girls, they would love to go there.  thank you for amazing post!